Friday Morning Prayer at the Toronto Missions Hub. Would it be like God to give His Body in America a prescient model and prophetic message for missions’ mobilization that we should seek to emulate? What if a new arrangement of biblical principles with current realities led to a fragrantly fruitful cultivation of a fresh generation of missions’ goers? Perhaps the following fascinating account is such a picture for our preferred mobilization future in the United States. During my four day visit to Toronto in January, it was bone-chillingly cold as I walked the streets of the downtown between the University of Toronto and historic Knox Presbyterian Church. Fortunately, they are right across the street from each other! As I scurried to appointments, meetings, and lectures around campus, however, there was a heated glow of excitement in that frigid downtown air about God being on the move on that campus, in that city, and toward the ends of the earth. I was there to observe what God was doing at the Toronto Missions Hub based inside Knox Church. My visit coincided with the all-hands-on-deck Relevant Week lectures brought by Ravi Zacharias Ministries and Power to Change (Canadian branch of Cru) speakers, skilled in evangelistic apologetics. Multiple campus fellowships partnered in free-flowing collaborations to engage with students about the Gospel, and Knox Church served as a base for operations. The Missions Hub and its sponsoring mission agencies were also on board to contribute breakfasts, worship, prayer, devotionals, logistical support, and spiritual encouragement. My outstanding hosts, Chez and Khevna, went far beyond the call of duty to make sure I was looked after, informed, and gaining access to who and what I needed to see. In the midst of a beehive swarming with activity, I was there to isolate and explore what God was doing with the Missions Hub. Beyond this current snapshot is a compelling backstory to how the Missions Hub began. And for me the key operative word for the creative dynamics I witnessed is “trust.” Deep trust in God, and deep trust in one another. Years earlier mission agency leaders in Toronto gathered for fellowship breakfasts periodically to share passions and experiences in the missions’ domain. Angst had been generated among agencies trying independently and intermittently to mobilize students at the University of Toronto into missions. Frustration over results served to create a desperation to experiment with working together. Around 2014, Tom, an apostolic leader at Knox Church, had the idea of co-locating agency offices under Knox’s roof. Although this initial idea did not get much traction, God gave Tom a new vision to have dedicated office space in the church for innovative collaboration between the church and mission agencies. 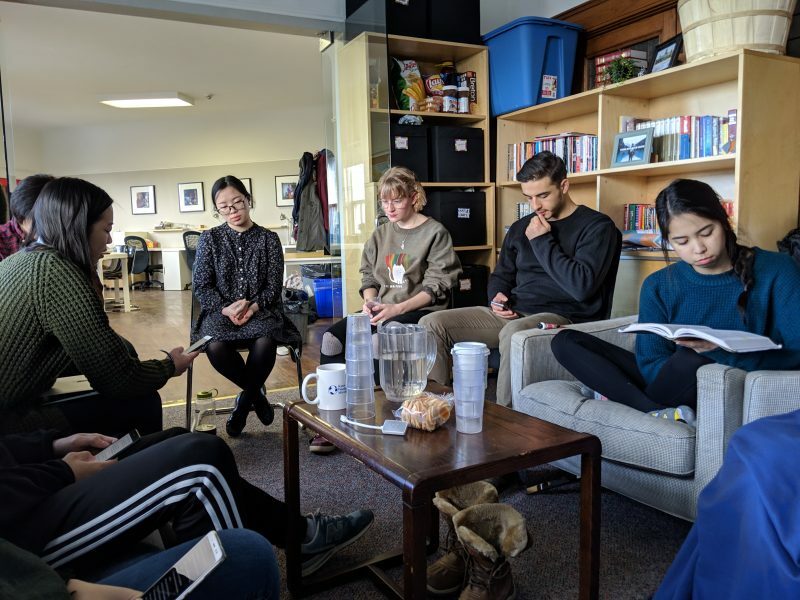 What if the mix of agencies seeking to mobilize U of T students went in together to hire a mutual mobilizer to work for all of them out of an office in the church? Missions agencies like TEAM, Wycliffe Bible Translators, Avant, and OMF bought in, and came together to equally allocate a percentage annually for a shared mobilizer’s salary. Knox’s consistent and generous contribution of vision, space, staff support, and resources has been the impetus for this collaboration. A shared mobilizer job description was carefully crafted by the Hub’s benefactors and led to a high-bar profile for just the right person. Honestly, the job description was (and is) very broad and demanding, requiring passion for people and the nations, event planning expertise, high EQ, humble networking skills, significant international experience, and strong spiritual maturity. Through an extensive interview process, just the right person was found in 2016. The Missions Hub has had a couple of transitions in leadership, but one thing has remained the same: everything happens through a spirit of generous collaboration and extravagant trust. It only works because each partner is willing to lay their individual flags down for the sake of Kingdom work together. There have been times when Knox staff served as Director. There was also a time when TEAM generously shared their mobilizer, Katie, to step in as Director. Each season allows for more potential of the Hub to be unleashed. God is clearly on the move! Essentially, the Hub Director and shared Mobilizer are the primary catalysts for the Hub to be as dynamic as it is. This tandem serve as the nexus for the growing missions’ mobilization movement that I encountered. The first Director has moved on, and the initially hired mobilizer, Chez, has taken the Director’s role. A new wonderfully qualified mobilizer, Khevna, has been raised up by God to fill the shared mobilizer position. A community development model for mobilization has formed. Agency mobilizers trust the Hub personnel to be the initial points of contact with students. The environment at the Hub is warm and welcoming. The needs of students are primary, and focus is given to meet students where they are and help them move forward in their life journeys. God-focused prayer punctuates conversations throughout the day. Missions vision-casting is woven naturally into the broadly collaborative process. Students are connected to the Missions Hub, primarily through their campus fellowship affiliations, where they can access a plethora of Hub events and groups. Events include prayer days, missionary speakers, workshops, mobilizer roundtables, panel discussions, and collaborative campus fellowship gatherings. While events serve a purpose at the Missions Hub, the ultimate aim is always building deeper trust with networks of Jesus followers, and equipping others to mobilize their communities through regular times of leadership training and globally-focused prayer. Spontaneous fellowship also occurs daily at the Hub. Students invariably rub shoulders with mission agency personnel and are discipled with a strong dose of God’s heart for the nations. Organic relationships, mentoring, and serving of constituent needs are steadily strengthening and expanding. The integration with mission agencies results in those students who express interest in missions being followed up, as well as having ongoing connections and conversations regarding opportunities for mission trips and internships. Long-term missionaries are envisioned, though it is too early to see substantial numbers there. Oversight meetings are held quarterly with Hub partners to assess progress, check alignment, and set direction. Confidence is high among leaders that the numbers of mission activists, including goers, will continue to grow. This strong network structure gives a solid foundation for the organic messiness one might see outwardly in the Hub’s daily activity. God is clearly and continually honored, and a strong sense of his Presence fills the space. Mobilizers who recognize (and feel a degree of desperation for) the need to innovate, and who are willing to make a commitment to making changes over the long haul. A generous, courageous, missions-minded church located by a campus, willing to donate a missions’ space, along with all the other staff support needed. Risk tolerant faith by agency leaders to lay aside traditions and invest sacrificially in hiring a shared mobilizer. “Generous collaboration” is the mantra among such brave leaders! A carefully curated process to bring on a powerfully catalytic shared mobilizer and director. Increasingly broad buy-in from campus fellowships who care about sending discipled students into the world. Lavish communications among all partners to maintain agreed upon Hub distinctives and allow time and freedom for the movement to grow. Above all, trust in God and in one another, exhibited by an environment that is God-focused, prayerful, humble, and hopeful. Deeply stirred by God through what I saw him doing at the Toronto Missions’ Hub, I couldn’t help but think that the U.S. is not far behind in our need to examine these principles for mission mobilization seriously and collaboratively. How might we partner together as agencies to let God do a new thing with us? Perhaps now is our time for new, God-pleasing configurations in mobilization. As our traditional approaches are waning, the world is waiting. This article is submitted by Mark Stebbins at The Navigators, a Missio Nexus member. Member organizations can provide content to the Missio Nexus website. See how by clicking here.